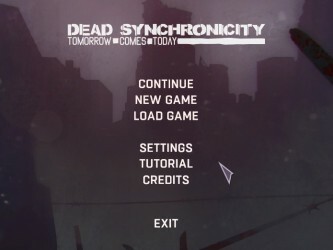 Dead Synchronicity is a game that spent a shamefully long time in my to-be-played pile, but finally the time has come to share my thoughts on this artistic and moody adventure game. In a genre with such simple mechanics and focus on fine details, the visuals are one of the only ways for an adventure game to differentiate itself. 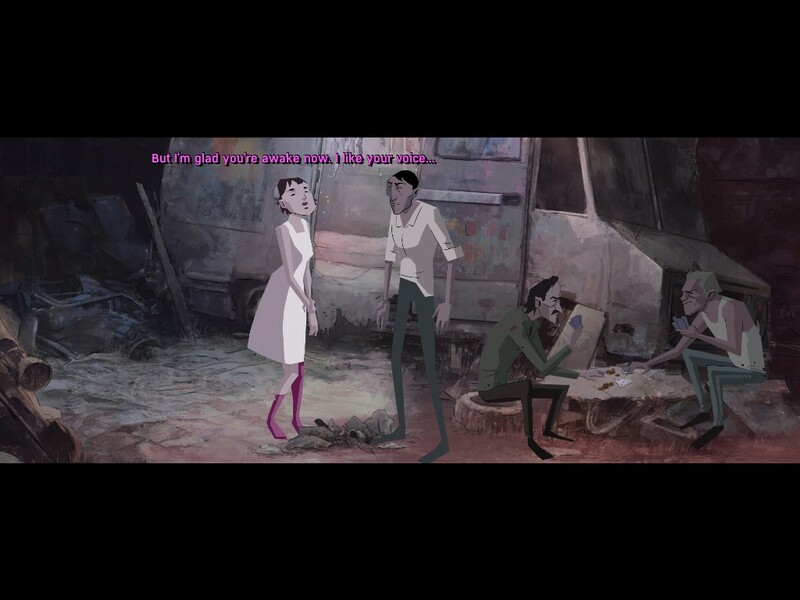 Dead Synchronicity went with an angular, stylized look which is quite distinctive. Animation is limited, with things like even mild lip synch usually only happening in the cut scenes and wide shots. For characters it works very well. Initially I thought there would be a problem with characters looking to similar to one another due to the fact that there’s a close similarity between the player character and the first person he meets, but despite the surprisingly large cast of incidental characters I found most NPCs to be visually unique. 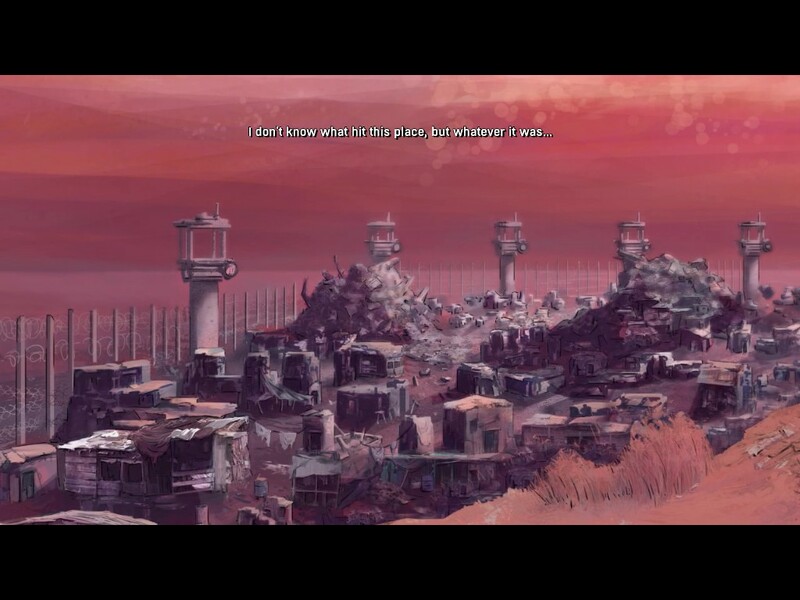 The setting of the game is post-apocalyptic, a world succumbing to the creeping decay of a disaster that caused society to crumble. It is therefore an excellent opportunity for an artist to render an environment made irregular and dismal by destruction and totalitarian rule. The decay comes through in each and every frame, something that can actually wear on you after a while. That said, feeling the weight of the disaster pressing down upon you is probably appropriate, adding to the mood and atmosphere of the game. During gameplay the scenes are fairly static, the camera sometimes sliding from one side to the other to follow the player or allowing the player to move into the background. During plot relevant cut scenes, though, things are a little more cinematic. Characters are more expressive, visual effects are more abundant, and transitions are more slick and produced. Sometimes, as you’ll learn about in the story section, you’ll also get a static effect and be treated to a mind-bending scene of the same setting in a state of greater or lesser decay. For the most part, the visuals are interesting enough to make continued exploration enjoyable, and details telegraph the location of important items well enough that I only missed a puzzle item in a given scene a handful of times, which is better than in most adventure games I’ve played recently. By now I would hope we are all well aware of what goes into making a point and click adventure game. You collected items, inspect the environment, and combine things to overcome the obstacles in your path. 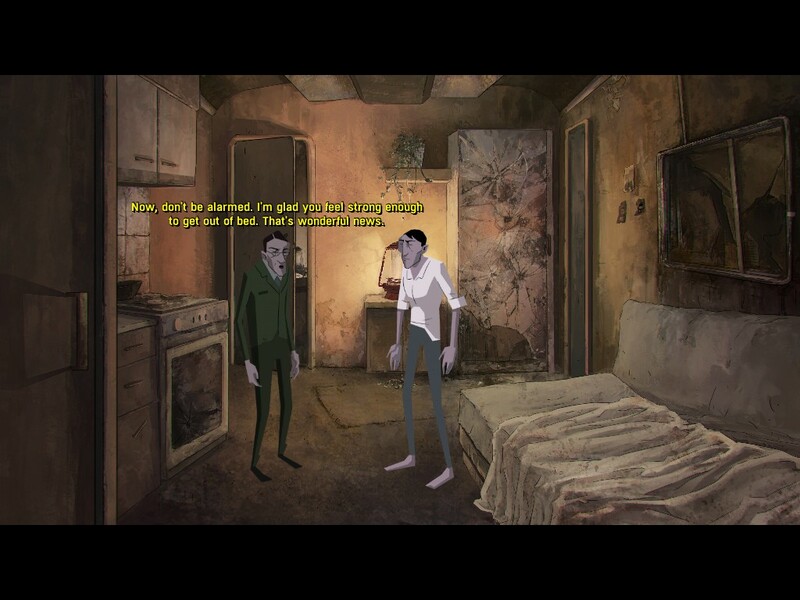 Dead Synchronicity, at least the portion of the game presented to us, doesn’t introduce any revolutionary concepts. Though there is dialogue, it’s largely linear and exists mostly to deepen your knowledge of the characters, setting, and plot. You won’t be doing any complex conversational gambits. It’s worth pointing out that one of my absolute favorite gameplay aids is in place, the “hotstpot highlighter” button that provides you with an indicator of the interactive hunks of a given screen. No pixel hunting for you. There’s no hint system to speak of, but there’s an automatically maintained journal that will let you know what major puzzles remain to be solved. The puzzles aren’t completely nonsensical, but some of the stuff is tricky enough that I got stuck for a while. One puzzle solution in particular, though, was simultaneously the best and worst part of the game for me. I don’t want to spoil the solution for you, but it required me to interact with an element of the game that was until that point an entirely visual phenomenon. It was miserable, because there was no way to trigger the even on command, you just had to wait a seemingly arbitrary amount of time for it to happen again. At the same time, it was awesome, because it seemed like it was indicating a brand new mechanic that would make for some very interesting puzzle solutions. It turned out to be the last puzzle in this chapter, though, so it was more of a cruel tease than anything else. That last part is important. This is not a complete game. It is a chapter of an eventual series, so prepare yourself for a fairly abrupt ending. The music is a little disappointing, exceptionally synthesized in a way that reminded me of a part of the eighties that I didn’t miss. The voice work is much better, though a decision they made occasionally makes for some stilted delivery of lines. You know how the screen can only handle a few lines of dialogue at a time? Well the dialogue was recorded in those same size chunks. That means you get a hard stop midsentence if a character is delivering a particularly complex thought. Despite this, the performances are pretty good and the characters are varied and distinctive. Like so many games, you start off with an almost non-existent knowledge of the current state of events. That’s right, amnesia. The in-universe explanation is that you are a “blankhead” a not uncommon occurrence in the world. You see, there was a terrible cataclysm of unknown origin that the locals call “the great wave.” It was an explosion that caused most of society to crumble. The dregs of humanity are held in check by a police state that has deployed military overseers into the ruins of the nearby city, and relegated those survivors displaced by the disaster into a refugee camp that’s more like a prison. If that wasn’t bad enough, there’s also a horrible disease running rampant, the sufferers of which are called “the dissolved” for reasons which are eventually graphically displayed. If you’re an adventure game lover and would like to sink your teeth into something with a more grimdark sensibility than most, Dead Synchronicity is worthwhile game. Just be ready for an ending that occurs right when it seems that things are kicking into high gear. 8.0 / 10: An adventure game fairly typical in mechanics, extremely dark in tone, and with an intriguing graphical style that will leave you wanting more.